I recently found out a dear, old friend passed away. I had called to wish him a happy birthday. His wife told me the news—he had passed away two years ago. Yep. Are you cringing like I did? Honestly, I couldn’t tell which was greater: my shock or my embarrassment. We had pastored different churches in the same town years ago. We had put on some good miles together. We were brothers in our Lord’s service yet he had also been a father figure to me. When he retired and moved away, I called him each year on his birthday to catch up. I saw his birthday reminder on my calendar. I knew I hadn’t called in a year or so—or had it been longer? Well, however long it had been, I looked forward to popping in on him with a call. His wife was gracious in telling me the news. She told me how he’d died. When I expressed how embarrassed I was for not knowing—for having neglected calling—she kindly told me how good it was to hear my voice and how much he had talked about me and our experiences together. I told her how much I’d respected him and how good it will be to see him again someday. We wished each other well and hung up. It took me a good while to regroup. Why hadn’t I called the last couple of years—or more?! I’d had the same reminder pop up each year. I knew nobody was holding this against me. Life gets busy—everyone knows that. Stuff happens. Yet, I regretted this terribly. The little things in life often end up being the big things. Skipping over them, thinking we can recapture them later, may set us up for a life filled with regrets more than memories. After some reflection, here are three things I’ve determined I can do to hopefully avoid more of these regrets. Obey my reminders. I’m good about making reminders—in my calendar, project management app, etc. I make them because they are important enough to me at the time to do so. The problem is that when they pop up to do what I wanted them to do, I’m in a different zone. I’m in the middle of something else and the importance that was behind the reminder to begin with is now overshadowed by…whatever. There certainly is a chance that it really wasn’t important enough to act on now; yet, my experience is that it was. I need to trust my decision; then, take a breath, and act on what I had told myself I need to do. Making the Happy Birthday call. Following through on my weekly “special time” with one of my kids. Taking twenty minutes to talk with my spouse when I get home from work. Calling my parents and checking up on them. Just do it. Seize the unpredictable. Many of life’s best opportunities come unexpected and unannounced. Like a deep, heart-felt question or comment from your child. Most of the great, memorable conversations I’ve had with my kids have come when I didn’t have time for it. I didn’t plan it. Yet if I didn’t seize that moment, it probably wouldn’t come again—at least not with the same potential. I’m not advocating not planning our time or not setting goals—anyone who knows me knows I plan things ad nauseum. We just need to be aware enough to recognize that this moment, although it wasn’t on the schedule, may be one that we will regret not embracing when we had the chance. Really do stop and smell the roses! The reason we have sayings like, “Stop and smell the roses” is because we generally don’t. Roses aren’t always in bloom. 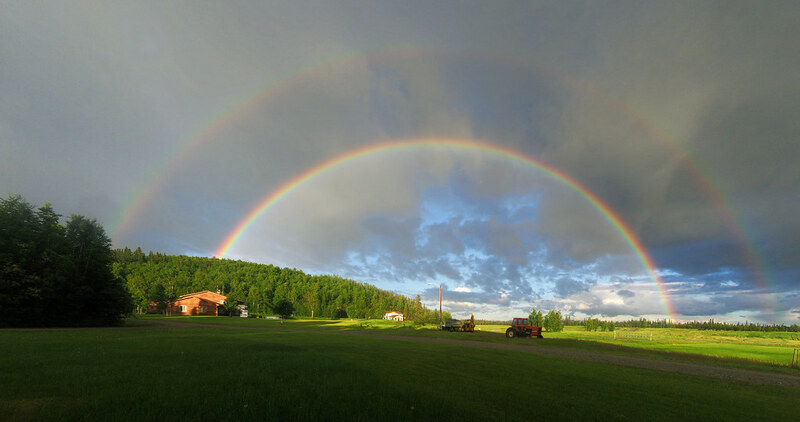 A full, double rainbow in the sky waits for no one. Your daughter won’t always want to play beauty shop with your hair. So celebrate little accomplishments and fleeting seasons of life. Seize moments that are here now and are worth rescheduling your plans to experience them. Watch amazing lightning storms or lunar eclipses as a family. Hoop and holler over a pulled tooth. Reschedule housework and take a family walk on that perfect autumn morning. Life is complicated enough without us making it more complicated. Watch for the seemingly little things in your life that may warrant closer examination. It’s okay to follow through on little things, to rearrange your schedule, to seize the moment. I want memories of a life well lived, not regrets of what should have been. Question: What helps you to avoid the potential regrets in your life? Share your answer in the comments below.